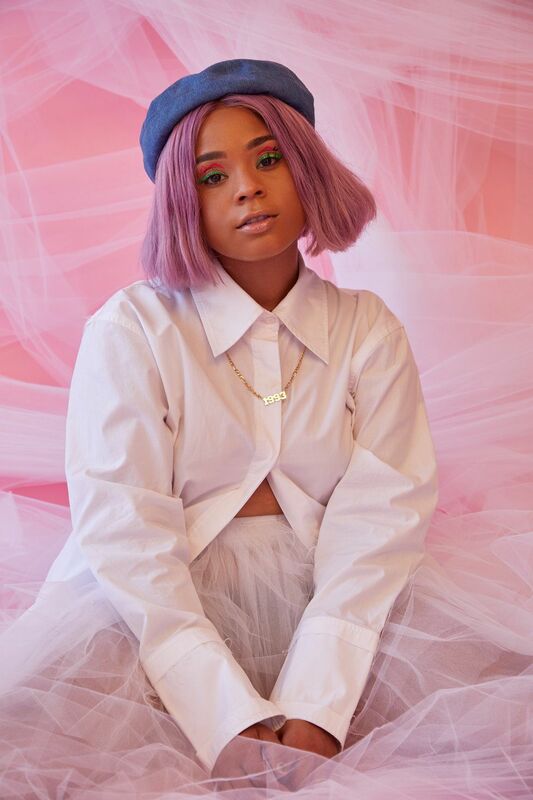 Tayla Parx is what you'd call a triple threat. At various stages in her life, the pastel-haired, animated pop artist has achieved success as a dancer, actor, and singer-songwriter. As a child growing up in Dallas, Texas, Parx skipped the traditional tap dance classes, and was instead, trained at legendary choreographer Debbie Allen's dance school. When she was 12 she made her acting debut as a co-star in the 2007 film adaption of Hairspray. Currently, at 25 years old, Parx is on the third leg of her creative journey, which includes writing chart-topping hits like Khalid and Normani's "Love Lies" and "High Hopes" by Panic! at the Disco. Only eight years after retiring from acting, Parx has reached incredible milestones as a musician. She has navigated important spaces that have notoriously excluded women, penetrated distant audiences that may not know her face but passionately sing her lyrics, and transcended musical genres through collaborations with top R&B, K-Pop, Pop, and Rock musicians. Yet, Parx's most impressive accomplishment to date has been her ability to retell other artists complex and personal stories in a way that mass audiences can not only relate to but move to. This month, three songs she pinned hit number one on three different Billboard charts, and one of the songs, Ariana Grande's first number one hit "thank u, next," even inspired a viral meme, which Parx admits was a major personal achievement. Between lending her talents to her good friend Ariana and superstars Alicia Keys, Rihanna, Jennifer Lopez, and Mariah Carey, Parx has been working on new music of her own. Her latest two singles "Me vs Us" and "Slow Dancing", reveals a two-part love story funneled through a soft sultry voice, as well as an affinity for slow and lingering dance beats. At the moment, Parx is in the studio wrapping up her forthcoming album, a follow up to 2017's Tayla Made mixtape. More than anything, the singer-songwriter appears to be happy to finally tell her own story through an album of her own, and artistically evolve and challenge herself again. How did you finally make the industry take you seriously as a musician and not just an actor? I went through this journey of saying, "Because I became more successful as an actress first people will see me as an actress who is trying to do music." I kind of just stuck it out and became a student of my craft. I continued to grow, and grow, and grow, and work my way into these rooms; work with some of my favorite writers and my favorite producers and just be a sponge along the way. Then, I found out that I'm able to go into these rooms and build relationships with the artists and truly listen to them and get their story across. What type of music are you experimenting with now? Lately, I've just kind of been bringing all these genres together, which is, I think, how my album We Need To Talk came about. It's just this blend of my recent experiences in love, which is different than my mixtape, the Tayla Made mixtape, which is a bit edgier and aggressive in the production. This album is kind of redefining genre, and gender, and rethinking feminism, and reshaping R&B and pop music. With my own music, I am able to kind of just make this fun, introspective, loud and quirky music that brings together all of the genres that I'm a fan of. Is your creative process different when you're creating music for yourself? When I'm making music for other people, it is solely about them. I'm here to listen to their story, I want to know who they are, why they do the things you do, why they felt the way that they felt when they tell me about personal experiences. It is about me being able to look at kind of this piece of art and interpret it. It's a really fun experience. When I write for myself, it's just kind of word vomit. Sometimes I'm writing things that are going to happen to me next week, there are thoughts that are sometimes subconscious. With me, I don't have any rules. I make sure that I set boundaries when I'm writing for other people because this is about them. My music is personal and just about me. What was happening in your life during the creation of your upcoming album? I guess love. I got my heart broken for the first time ever. That was just an extremely personal place for me to be emotionally. I used to be very afraid to be vulnerable and very afraid to get hurt, and now I'm realizing there's strength in that, there's strength in being able to say, "Okay, I got hurt and I'm okay." I learned this from that experience and now I'm one step closer to knowing what I do want out of love or out of life. Where did you record most of the album? Did these cities influence your music? Most of it was recorded in LA and New York. I've been bouncing back and forth from the East and West coast a lot lately. It's definitely affected the music sonically. I love to travel. The mixtape, for instance, had a lot of UK influences because I was traveling back and forth a lot. This time I think it's not a sound but more a vibe. When you hear a record I have called "Somersault" it sounds like you're driving down the 405 with your windows down and it sounds like it's 80 degrees. It just has those moods that kind of transport you into wherever I was at that moment. Then you start to get to some of the slower songs and there's that grittier kind of New York vibe and their very very honest as well. What inspires your animated videos and overall quirky visual productions? For the "Me vs Us" video we were trying to decide on a concept and things that evoke the same colorful emotions that my song does. I like to think outside the box when my viewers and listeners experience me so the entire video is exploring gender reversal or neutrality, as the entire album We Need to Talk does. I never say he or she in any of my songs, so I think it will be fun to continue to leave it up to the listener's imagination and keep approaching every single visual with the same open-ended mentality. Can you take us through the process of recording Ariana Grande's hit song "thank u, next"? "thank u, next" was such a real therapy session. That week we were in New York and Ariana was so good at being open, vulnerable, and able to share what experiences she was going through. She took a big part in writing the record as well, which is rare for artists. But this record is so personal that I don't think that it could have been done without her in the room and she'll say that as well, that this is probably one of her most personal records. It was just made by friends having a good time. Just being there for her, being there for our friend, and listening to her. We wrote the song in about an hour and we wrote a few different versions. Mind you, we were writing her life so what if she did end up getting married, you know what I'm saying. So there are three different versions and then we ended up going with the original.